This week's featured state, Arkansas, is one that's very dear to me. Back during my single years, I had a girlfriend who was from Arkansas, and she and I made many road trips to Arkansas from Georgia to visit her family. There are such lovely people there, and I have great memories of Arkansas to this day! • Do you remember the first tea room you ever visited? I wasn't keeping records (or blogging) back then, but I believe the Crumpet Tea Room in Rogers, Arkansas, was the first tea room I ever visited! My friend's mother introduced me to it, and I absolutely fell in love with the ladylike atmosphere, the mismatched china, the floral linens, and of course the delicious food. One of the foods they were known for was their Open Face Crab Sandwich on a crumpet (above), which I made and blogged about here using the recipe in their Crumpet Tea Room cookbook, a prized possession. The Crumpet, as locals called it, was also known for its legendary Orange Rolls, and that recipe is here. The Crumpet Tea Room continues today in two locations, so if you ever go to Arkansas and are in the area, be sure to look them up! • If you've been to Arkansas, you've probably visited or at least heard about Eureka Springs. It's a beautiful tourist town in the Ozark Mountains, and I loved seeing all the wonderful Victorian cottages and homes there. 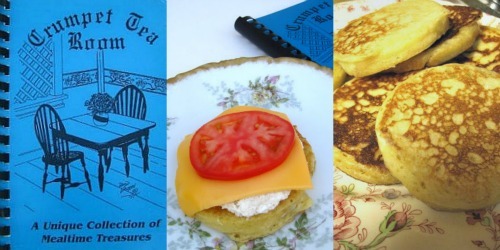 Arkansas has clearly been blessed with tea rooms over the years, and when I devoted my Saturdays to exploring tea room cookbooks in 2013, I made quite a few dishes that originated in Arkansas tea rooms. 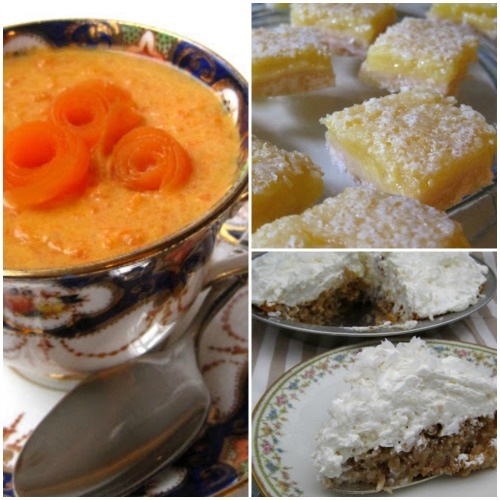 Shown here are, clockwise from left, the Carrot Soup from the Victorian Sampler Tea Room in Eureka Springs (recipe here), Lemon Squares from the Yellow Daisy in Little Rock (recipe here), and the ridiculously easy and delicious Surprise Pie from Katy's Korner, the precursor of the Victorian Sampler (recipe here). So even if you've never been to Arkansas, you can dine as if you have! • Arkansas is also the home of a "new" brand of tea I'd not heard of before, Betsy Ross Tea, which was once packed by Plunkett-Jarrell Grocer Co. in Little Rock, Arkansas. 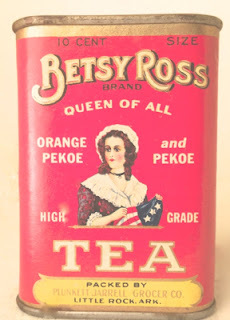 The side of the Betsy Ross tea tins reads, "Betsy Ross Brand Tea is a blend of Fine Teas, selected especially for this brand from the early pickings of young and tender leaves, skillfully blended, which will produce a delicious beverage, rich in strength and flavor that will satisfy the most critical consumer." I haven't been able to date this brand just yet, but based on the 10-cent price, I'm not looking for this one on my next visit to the grocery store! Mary J. wins the Amazon gift card! Congratulations to the winner of the $25 Amazon gift card, Mary J., who just finished reading "Finding Noel" by Richard Paul Evans, is currently reading "Absolute Surrender" by Andrew Murray, and is daily reading her Bible and "Fifteen Minutes Alone with God - For Women" by Emilie Barnes! I've sent Mary an email and look forward to getting her gift certificate to her ASAP. A huge thanks to all of you who entered this giveaway. It was wonderful to learn what diverse reading interests this group has — and now I have a new reading list that will probably last me for years! Well, the name suits, don't you think? 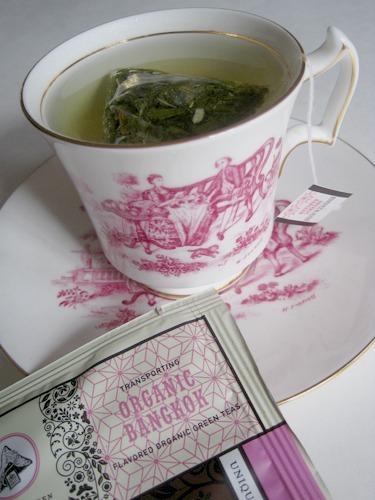 The Bangkok tea, by the way, is just delicious! I've been sipping lots of spicy teas, brisk black teas, and peppermint teas lately, and I suppose too much of anything can be a bore, so I was surprised by how delicious I found this green tea flavored with lemongrass, vanilla, coconut, and ginger. Coconut was the first flavor I detected, and I enjoyed my tea with some coconut cookies for a simple afternoon snack. So that counts as a Bangkok Tea Party, don't you think? Someone on the Afternoon Tea Across America Facebook group (sorry, I don't remember who!) 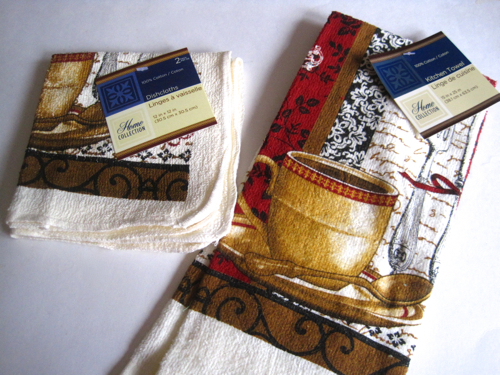 recently posted about finding some new teatime linens at Dollar Tree. Since I was near one yesterday, I decided to swing by and see if the items were at my store, and they were. I bought a dish towel and two dish cloths, and they also have matching plastic placemats. Granted, these are exactly the quality I've come to expect from Dollar Tree, which is to say, the towels and dishcloths are on the thin side. That said, they do have teacups and handwriting on them, so I had to have them. And I like the graphics of the flatware as well. So if you need some cheap kitchen cloths with a happy design on them, I think these will do the trick, even if they don't last forever! And inside are two more covers. The one on the right is actually my favorite of the three, but I think they were wise to, according to a note inside this issue, select the one with the cake for the issue sold on newsstands. 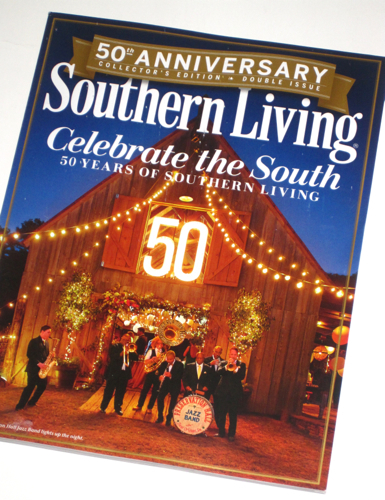 For Southern Living is known for its cake recipes, including what is lovingly referred to as The Big White Cake on the cover at Christmas. 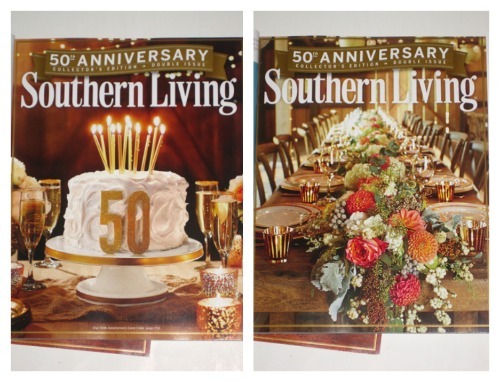 So it's more than a little fitting that this gigantic 50th anniversary issue includes a tribute to southern cakes, and that's what I wanted to talk about today. I love cakes. I love how cakes show up at all kinds of celebrations (including teatime!) and make an occasion special. My favorite cake in the world, and the one I request for my birthday each year, is my Daddy's coconut cake. He recently sent me home with a nice big chunk of coconut cake he'd had left over from Christmas and frozen. It was just as good as ever, especially when a slice was served alongside a nice hot cup of tea. 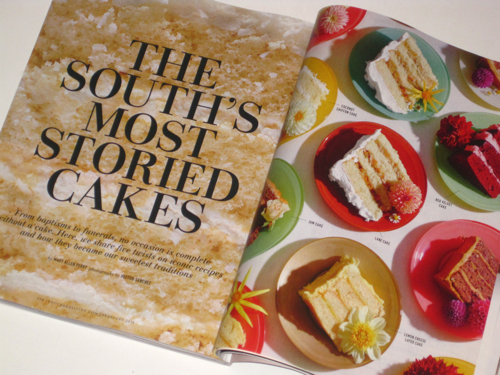 Southern Living has updated five classic southern cake recipes of its own, and they are: Coconut Chiffon Cake, Red Velvet Cake, Lane Cake (the liquor- and fruit-filled cake famously mentioned in "To Kill a Mockingbird"), Jam Cake, and Lemon Cheese Layer Cake. You can bet I'll be making one of these soon, and I'm pretty sure it will be the Coconut Chiffon Cake. I'd love to know if southerners agree with these selections. (Personally, I'd have included a Hummingbird Cake and a Caramel Cake.) 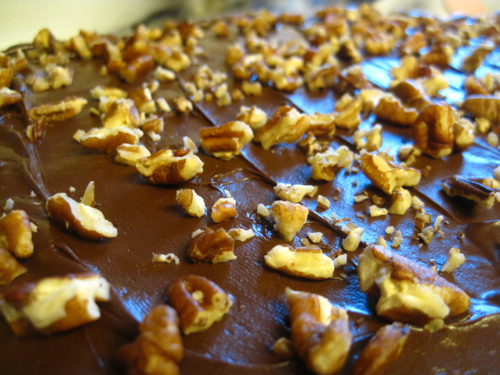 For those of you who live in another region of the country, is there a special type of cake you love that's not on the Southern Living list? Just when I think I've said all I have to say about tea and I'm wondering how many blog posts I could possibly have left in me, a spark of inspiration always, always arrives in a most unexpected fashion. 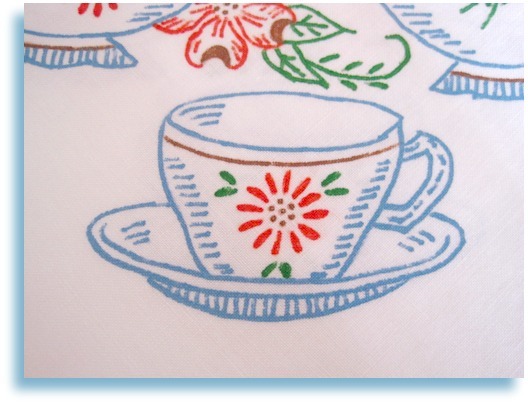 A few days ago, it came in the form of this utterly charming, new-to-me vintage tablecloth from tea friend Margie in California. Isn't this adorable! 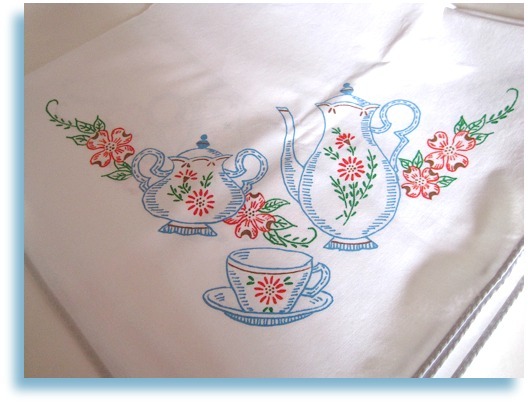 This is a printed design that simulates old-fashioned embroidery, and I absolutely love it because I don't have one like it at all! 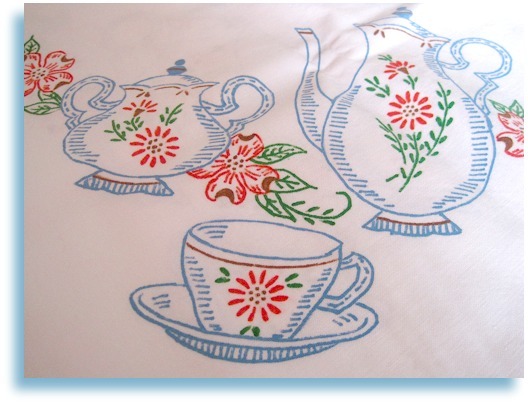 I have a few embroidered tea-themed tablecloths, but the embroidery is no longer in good condition, and while I don't necessarily mind that, I do love the pristine shape this tablecloth is in. 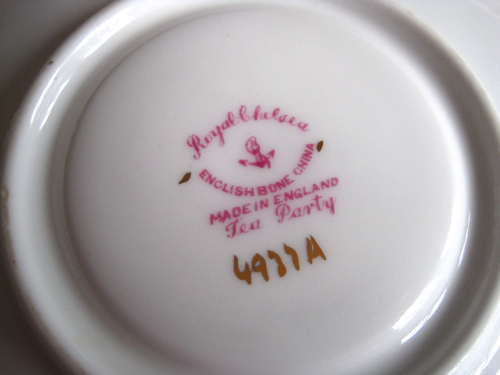 Here's a detail of one of the teacups, and the same design is repeated in all four corners. 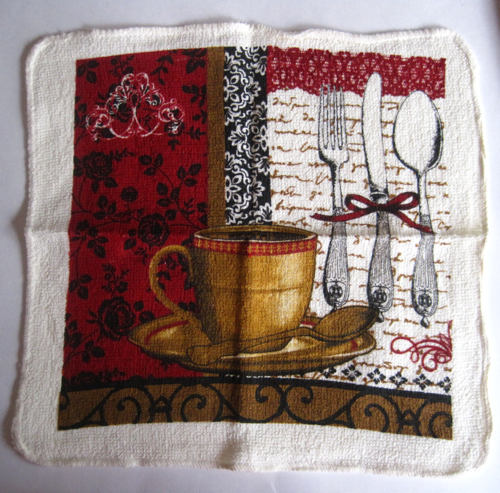 Because of the red in this tablecloth, I was also inspired to start thinking about this year's teatime Valentine's Week display. I think I've found the perfect tablecloth to use as my backdrop this year, don't you? I make my living as a writer and editor, but as an aspiring novelist, I must say that one of the most important things I do each day is read! For some time now, I've been wanting to know what *you* are reading in the way of books, and I'm not above bribing you to tell me! 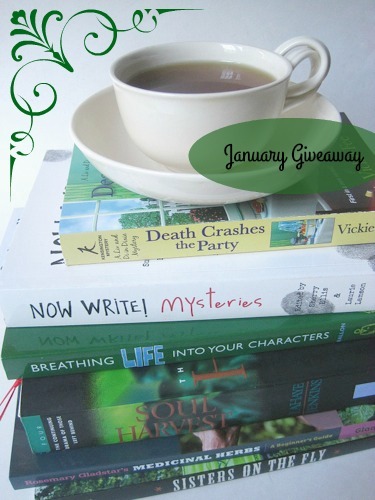 So if you'd like to be entered to win a $25 Amazon gift card, just leave a comment by Friday at 7 a.m. EST telling me the last book you read, the current book you are reading, or the book you would like to be reading! (Overachievers may feel free to share all of the above.) The winning entry will be chosen by a random number generator and announced on Friday. In case you're curious, I thought I'd go first and share what I'm currently reading! Although I didn't photograph my Bible, technically that's the first book I read each day. As columnist Cal Thomas once said, he likes to read his Bible along with his newspaper each morning so he'll know what both sides are up to. I agree! • "Death Crashes the Party" by Vickie Fee. Since cozy mysteries are what I'm trying to write, I try to keep a cozy in my reading stack at all times, and I just finished one over the weekend (which I didn't really care for), so I'm hopeful about this new series. Plus, the author is a former journalist, like me, so I'm betting I'll enjoy her book! • "Now Write! Mysteries," edited by Sherrie Ellis and Laurie Lamson. This is a book of writing advice for mystery writers of all stripes, and I'm allowing myself to read just a chapter or two at a time. Lots of meaty stuff here. • "Breathing Life Into Your Characters" by Rachel Ballon. I've decided some of my characters are a little dull, so I've been reading this book to learn more tips for making them more likable, readable, relatable, etc. This book feels like homework, but I rather suspected it would. • "Soul Harvest" by Tim LaHaye and Jerry Jenkins. Remember when everybody was reading those "Left Behind" books years ago? I didn't. I have this real ornery streak where I don't like to read what everyone else is reading (unless it's a tea book; then I don't mind). But then I read Jerry Jenkins's excellent book of writing advice, "Writing for the Soul," in which he critiqued some of his own early writing in those books. Out of sheer nosiness, I was going to read just one book to see if it was as bad as he said. (I didn't think it was.) And now I'm hooked and have to read the whole series. • "Medicinal Herbs" by Rosemary Gladstar. My friend Deberah gave me this book for Christmas, and I was so happy to get it because even I know that Rosemary Gladstar is a rock star of the herb world. There are also instructions for making a number of herbal teas in this book, so you may be hearing about this title again before the year is over. • "Sisters on the Fly: Caravans, Campfires, and Tales from the Road" by Irene Rawlings. I have this idea for a character who buys and restores a vintage camper, so I'm reading this book to learn more about the sort of women who inspired the vintage camper craze. Research is one of the most fun parts of writing for me. • Quite a few other kinds of truly “Arizona tea,” however, can be found in the 1942 USDA Publication “Flowering Plants and Ferns of Arizona” by Thomas H. Kearney and Robert H. Peebles. 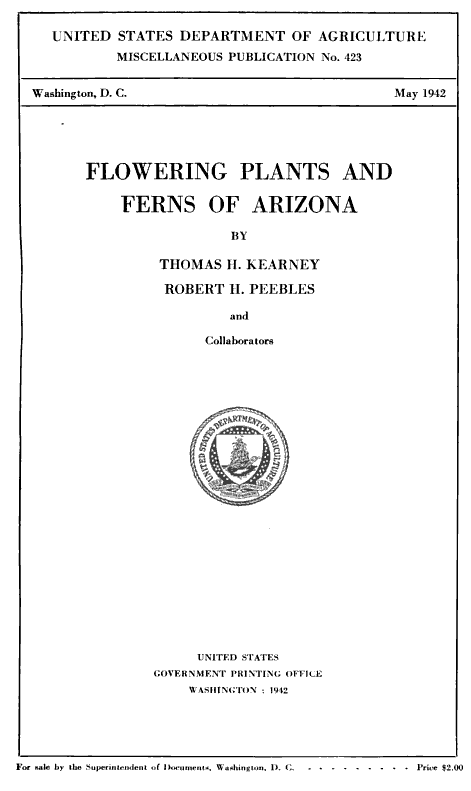 In this publication, I found quite a few references to plants used by Native Americans and “early white settlers” to made medicinal tonics. 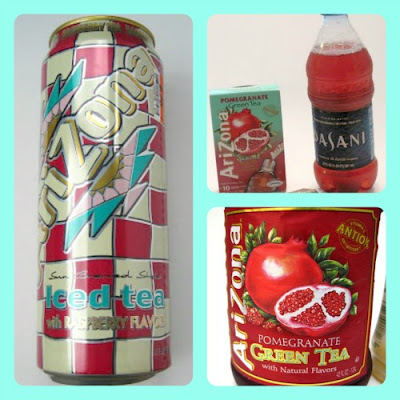 One of these was made from certain types of the ephedra plant and was known as Mormon tea or Brigham tea. (Perhaps that was because such “teas” aren’t actually camellia sinensis, which I understand that Mormons do not drink.) There were also references to plants known as Spanish tea, Mexican tea, Hills tea, and Navajo tea, so these portions of the book make for interesting reading. Click here to download a copy for free yourself. • Hotel teas can vary in quality, but in Googling tea in Arizona, I found several references to afternoon tea at the Arizona Biltmore in Phoenix. I was delighted to come across this video featuring their tea sommelier and showing some of their lovely offerings. If I'm ever near Phoenix, tea here will be a must! The hotel, a Waldorf Astoria Resort, was built in 1929, and Frank Lloyd Wright was the consulting architect. 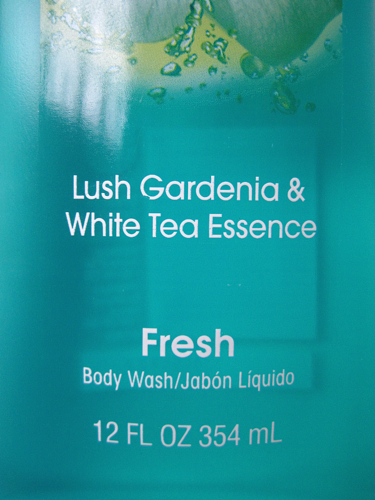 Lush Gardenia & White Tea Essence. Or so it says. 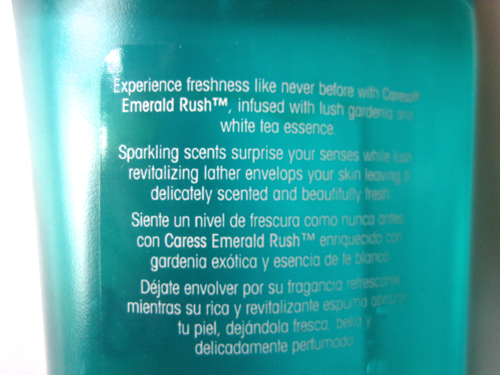 When I checked the ingredients panel, I could find no camellia sinensis listed, so maybe it's in the "fragrance" ingredients, but I did note that they mention that this body wash is infused with "white tea essence." 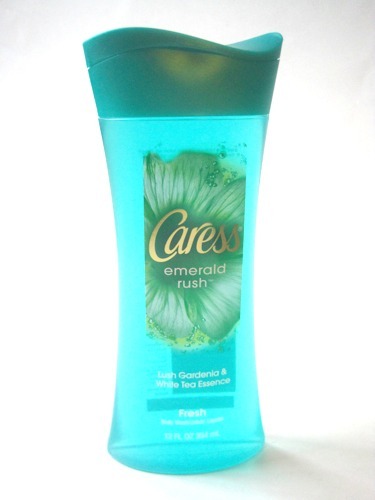 The body wash had a pleasant scent, but it was surprisingly woody and not what I expected from something with "gardenia" in the name. I detected no gardenia fragrance, which was a disappointment, but the body wash lathered up really well, so all in all, it was … a wash. I meant to share this recipe last week after I had my small tea party for two friends, but since I found this recipe still sitting in a folder on my computer desktop, I knew that meant I'd forgotten to post it! I'm betting many of you have made Cake Mix Cookies before, but if you haven't, this is a super easy recipe it's good to have on hand. 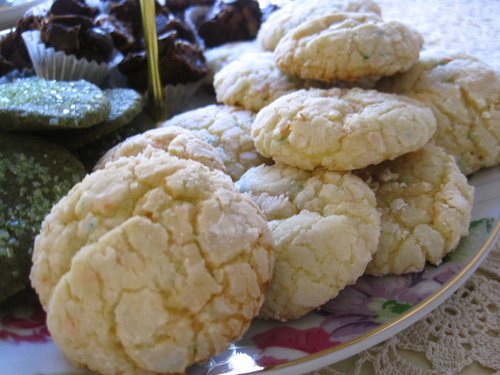 The ones I made here were with the Betty Crocker Party Rainbow Chip variety of cake mix. I'd made some cookies from a boxed cake mix years ago and enjoyed them, but I forgot about them until my pen pal, Sandy, favored me with a few recipes in her last letter. This one, she called Fudge Crinkle Cookies, and she used the Betty Crocker Supermoist Devil's Food Cake Mix. Because I wanted to send some of the leftover cookies home to two little girls, the daughters of my friend Angie, I thought the colorful sprinkles in this variety would be nice to use for the girls. But to my surprise and delight, it was my other friend, Amy, whose young adult sons raved over the cookies I sent her home with, and one of them asked if she knew me well enough to request the recipe. I thought that was amusing considering how easy these cookies are to make! So here they are as I made them, and next time, I'm making the chocolate ones as Sandy does. Preheat oven to 350 degrees. Mix (by hand) cake mix, oil, and eggs until a dough forms. Dust hands with powdered sugar, roll batter into 1 inch balls, and place 2 inches apart on ungreased cookie sheet. Refrigerate 10 minutes. 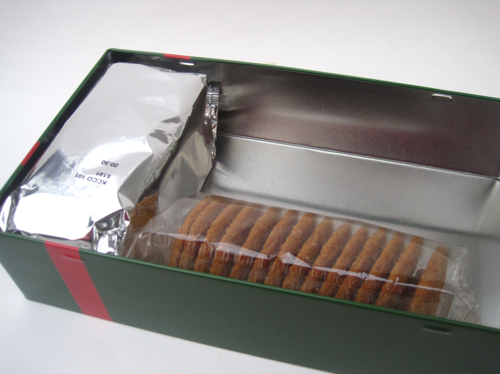 (Sandy notes that this step gives cookies the “crinkle” look and keeps them from absorbing the sugar.) Then bake for 10-11 minutes or until set. Deliciously easy! 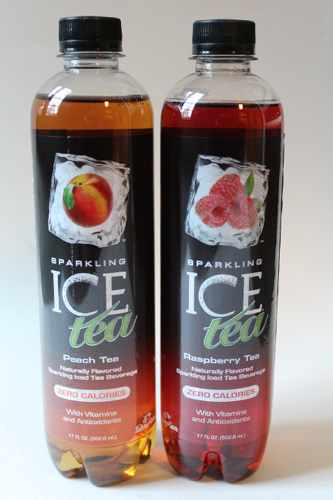 "Sparkling Ice Tea." Does the word "sparkle" appeal to you as it does to me? It makes me think of shiny, twirling little girls in tutus. It makes me think of mirrors and gleaming glass and glitter and beautiful, glistening, pearlescent snow (which only my brethren and sistren in the northern part of the state are supposed to get this week, not that I'm bitter or anything). 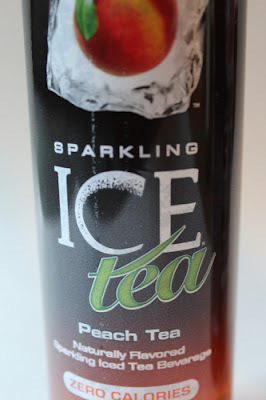 Anyway, my point is, I like the word "sparkle," so I had to bring home these "sparkling" teas I found at Kroger this week. These drinks are made by a new-to-me company called Talking Rain. 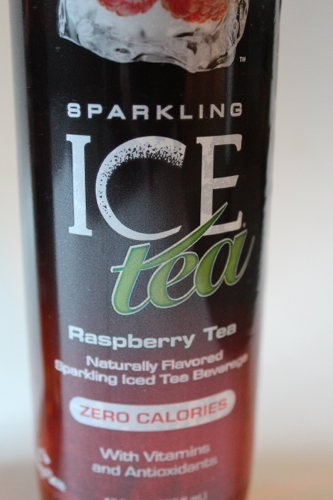 The nice thing about these fizzy drinks is that they have zero calories (they're sweetened with sucralose) and are naturally flavored with juice, tea, and natural flavors. I always try the peach flavor of anything because I love peaches. Peach-flavored drinks tend to fall into one of two camps: sugary or tart. This fell into the tart camp, which I prefer. And to my surprise, I liked the raspberry flavor even better! These teas fizzed up nicely when I poured them over ice, and I think it would be fun to serve tea party guests a pretty goblet of sparkling tea to enjoy along with their hot tea. But what do you think? Would you try it if you were served some sparkling tea, or do you consider that a tea party abomination? 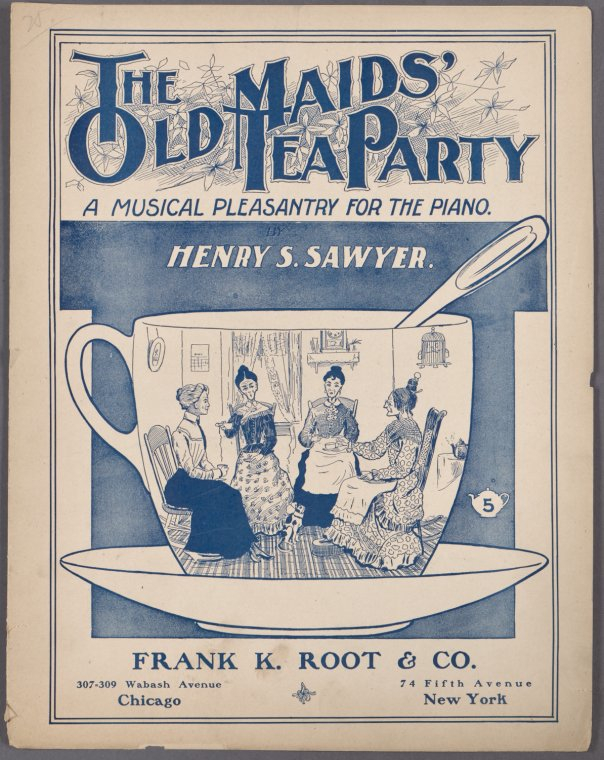 Recently, tea friend Margie in Canada alerted me that the New York Public Library has made their collection of digitized public domain images available for free downloading. What a gift! 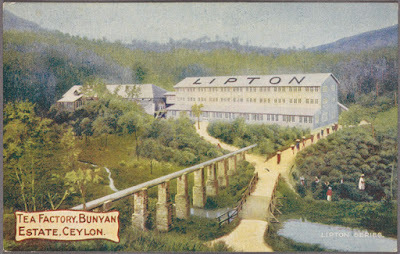 This image, for instance, is a 1908 Lipton tea postcard showing a tea factory in Ceylon. 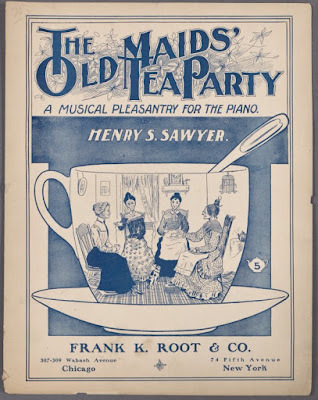 I'm interested in tea images from anywhere, but since I am researching tea in America this year, I am thrilled to learn that there are even more vintage images I can legally download and post on my blog! 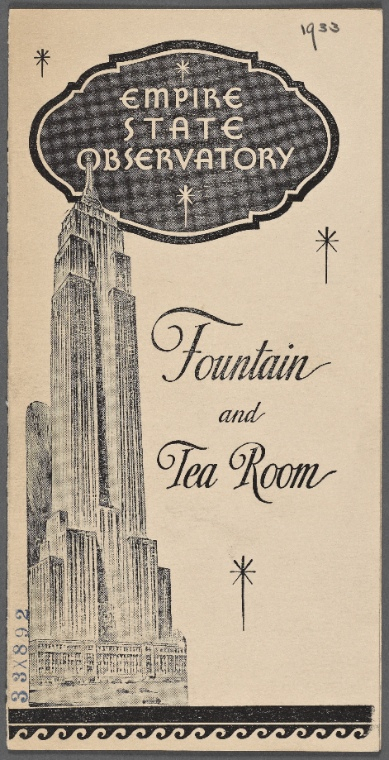 When I was researching my book "Dainty Dining" a few years ago, I found a number of menus on the New York Public Library website, but I didn't have access to them. Now I do. So now anyone can click on this old menu and learn that in 1933, a pot of tea at the Empire State Observatory's Fountain and Tea Room sold for 20 cents! Over the weekend, I had the pleasure of enjoying a trip to Callaway Gardens in Pine Mountain, where my husband and his cousins held a reunion. We had a great time together (I especially love hearing the family stories), and the cousins who organized the trip had prepared goodie bags for us all that included some of the most delicious cookies and bars I've had in a while. 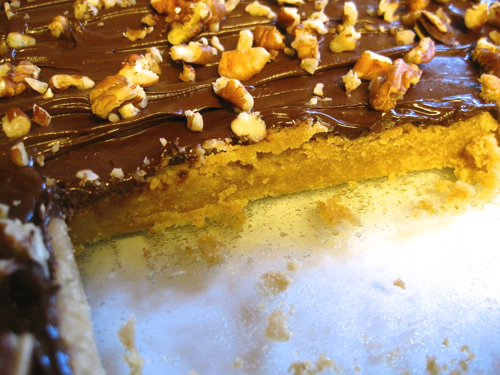 The toffee bars, in fact, were so absolutely perfect, when I got back home, I started looking for a simple recipe so I could make some more of them. 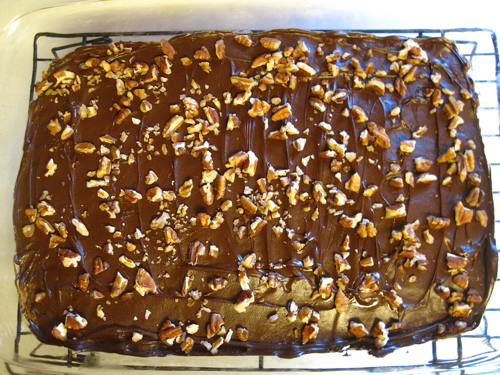 Thanks to Betty Crocker, I now have an easy and delicious new Toffee Bar recipe to keep on hand. Sunday afternoon after church is a favorite time for me to experiment with baking. I've usually had a nice nap first, read a few chapters in a novel (one I'm not writing or editing! ), and am starting to count down the hours to "Downton Abbey," for which I will, of course, require an appropriate sweet. So yesterday it was these toffee bars. … combined with the richness of melted chocolate chips and pecans is so decadent, and it's one of the best teatime treats I can imagine. The caramel-like flavor from the brown sugar is why I enjoy toffee treats so very much. 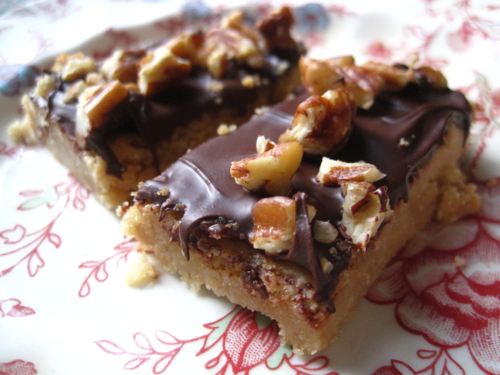 Do you have a toffee candy or bar recipe that you like to make? 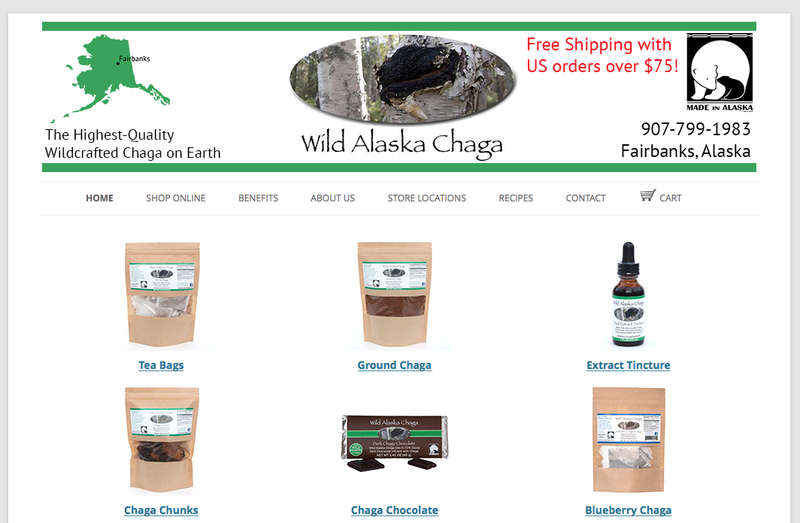 • When I looked on Tea Map, I found only two tea rooms in Alaska listed there, and the second one on the list is now closed. The currently-in-operation tea room has a lovely name, Sipping Streams Tea Company. It's in Fairbanks, and when I went to Facebook and clicked on the Sipping Streams menu, I was delighted to find that they offer various afternoon teas, and appropriately enough, an Alaskan Salmon Tea Sandwich is one of the offerings. Anyone going to Fairbanks anytime soon? Take me, and we'll go to tea! 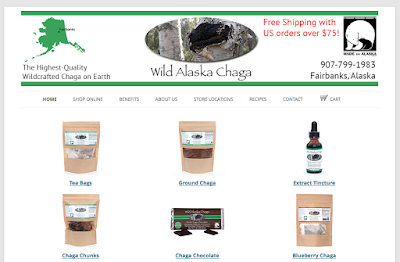 • Have you been on an Alaskan cruise? I haven't, but those who have tell me it's a wonderful experience. I've been on a cruise (to Mexico) only once and haven't really considered cruising again. Then I came across this YouTube video of afternoon tea on the Oceana Regatta, posted by a gentleman named Dennis Champion, and I think I may just reconsider! Have any of you enjoyed tea on a cruise, any cruise? Recommendations would be nice! 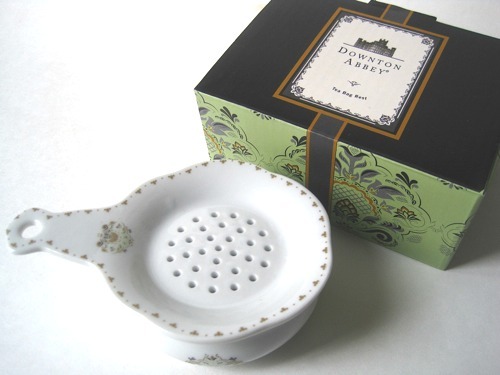 A "Downton Abbey" tea strainer! I was so curious when I went to the mailbox the other night and found a package inside from tea friend Frances L. in California. The small, square box was rather heavy, so what was inside? 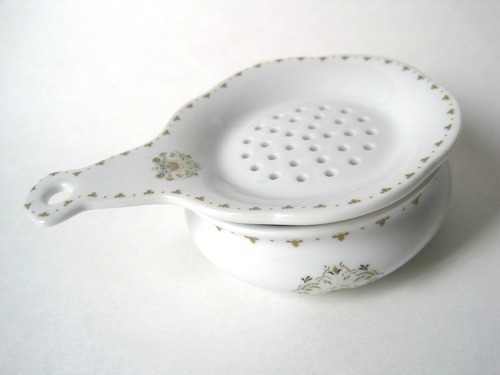 Well, it was a "Downton Abbey" tea strainer from the World Market collection of "Downton Abbey" teawares, and I absolutely love it! Frances noted that they have labeled this a "tea bag rest" and may be losing out on some loose leaf tea business (and I agree!). Isn't the design pretty? I think it's quite regal and so befitting "Downton Abbey." And now I have a permanent memento of the show, one that I will no doubt enjoy using for many years to come! 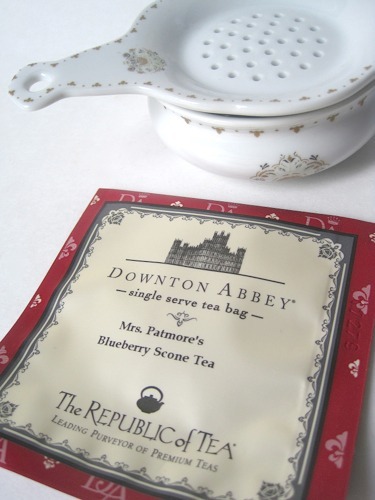 Frances also included a sample of a new-to-me DA tea blend, Mrs. Patmore's Blueberry Scone Tea. I don't suppose I have to tell you what I'll be sipping come Sunday night. And can you believe we're already on Episode Three? 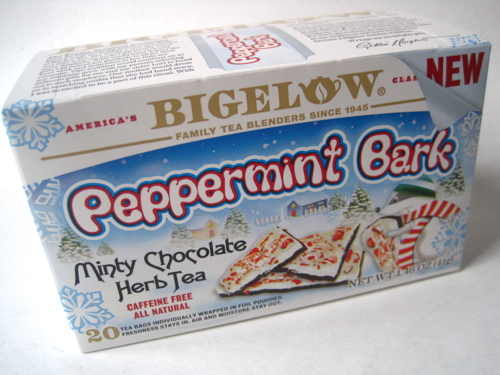 I'm so happy when I come across a new tea in the grocery store, and the other day I came across this Bigelow Peppermint Bark Minty Chocolate Herb Tea at Kroger. 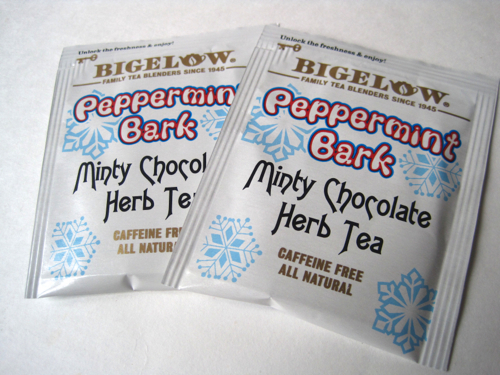 Of course, one thing I have long loved about Bigelow's teas is that they come individually sealed. That's great for freshness, for travel, and for sharing with friends! 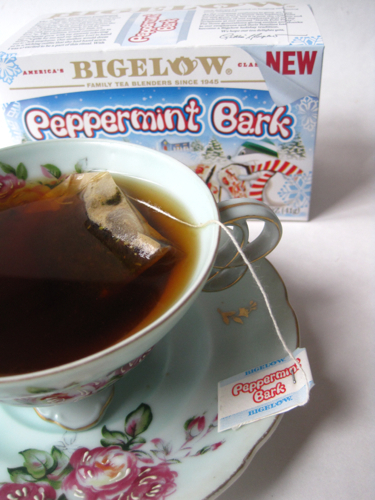 Now I'm quite fond of peppermint teas anyway, but this Peppermint Bark tea is just terrific! It's rich and chocolatey and minty, and since I drink peppermint-flavored teas all year long, I think I probably need to stock up on this great new flavor! Have any of you tried this tea? Recently, I shared a newspaper column by Mr. Tea With Friends, and some of you asked for more. (Bless your heart, as we say.) 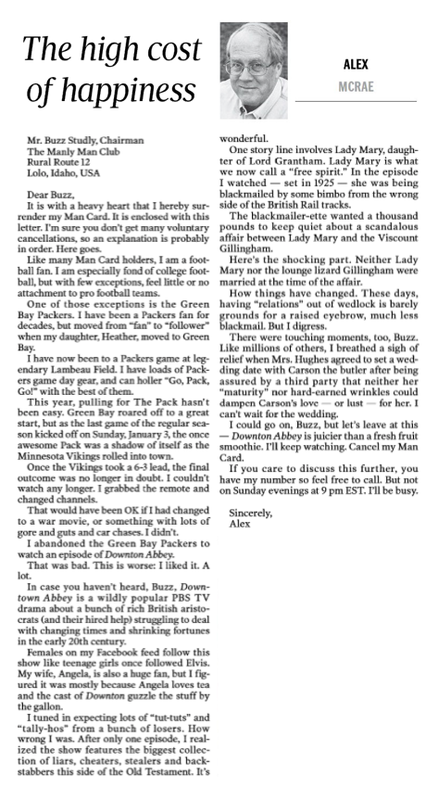 It's rare for a columnist to write about his or her spouse, so I was as surprised as anyone to find my name in his column yet again this past Sunday. 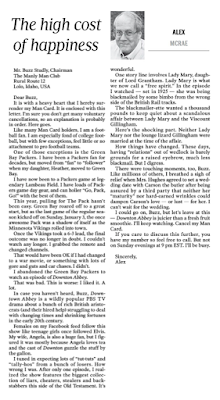 Here's a link in case you'd like to read his Sunday Newnan Times-Herald column for yourself! My first teatime of 2016! 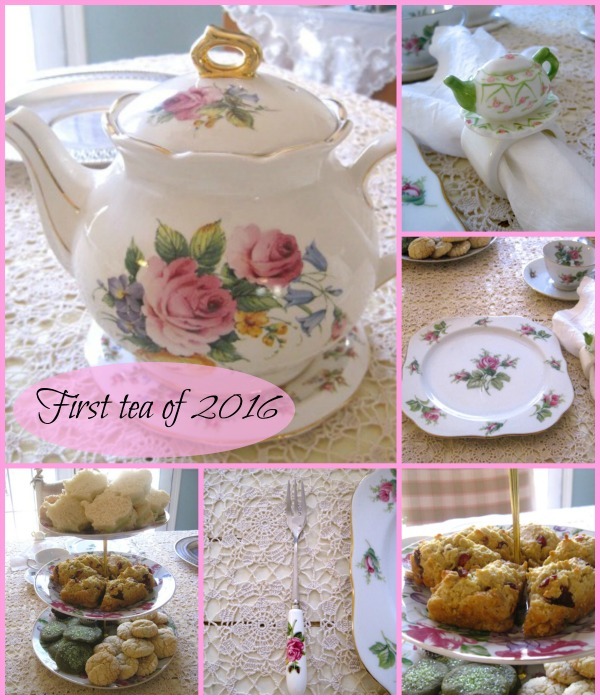 One of my goals for the new year was to host more teas in 2016, and I got to host my first one yesterday with my friends Angie and Amy! Monday worked for both of them, and one of the great things about having my own writing business is that I can juggle my schedule to work whenever I like. 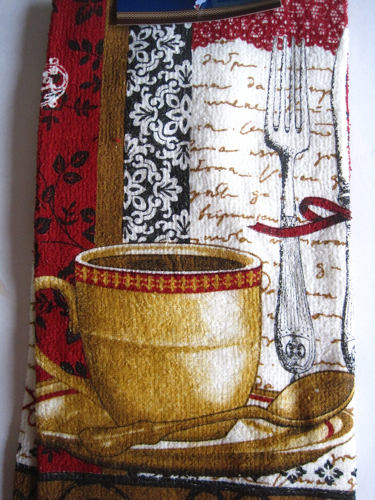 This week, that meant kicking off the week with tea, and I must say I liked it! I hadn't seen these two friends in a while, and I so enjoyed the luxury of getting to catch up with them over cups of tea and some teatime treats. I made almost everything on Sunday afternoon, so all I did on Monday morning was bake scones and assemble a few tea sandwiches. Our menu included Cucumber Sandwiches (the teapot-shaped ones), Pimiento Cheese Ribbon Sandwiches, and Broccoli and Cheese Mini Quiches (forgot to get a picture; you know how it goes!). 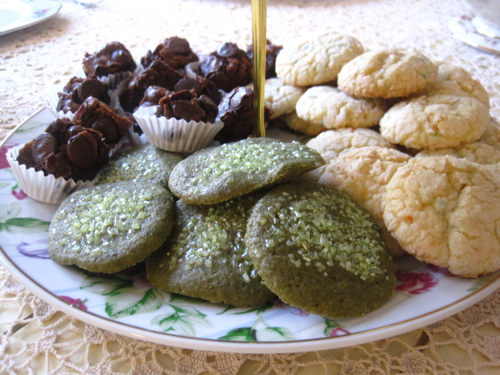 We had Cranberry Scones with Lemon Curd, and our sweets were Cake Mix Cookies (thanks to a super easy recipe from my pen pal, Sandy), Matcha Sugar Cookies, and Dark Chocolate Fudge Brownies. The other thing I enjoyed about this "tea with friends" was that I was able to use so many teawares from friends. I used a three-tiered server that was a gift from Linda Rivers, who operated the Holly Cottage Tea Room in Newnan. The little rose pastry forks were a gift from my friend Liz, and the plates, cups, and saucers were a gift from my friend Deberah. I loved mixing and matching all these rosy wares, and it was just the thing to kick off my year of more tea parties. Have you been to tea yet this year? If not, when do you think you'll enjoy your first tea of the year? I'm all for making plans! 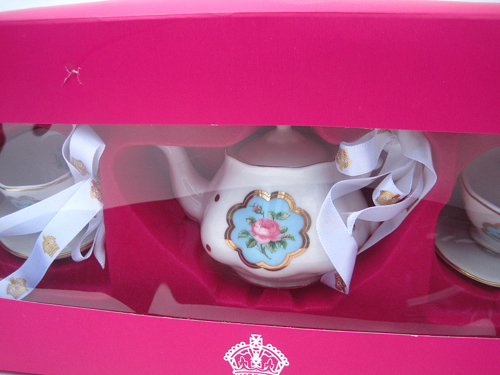 Let the record show that I bought my first teacup and teapot ornaments of the year in January instead of August! 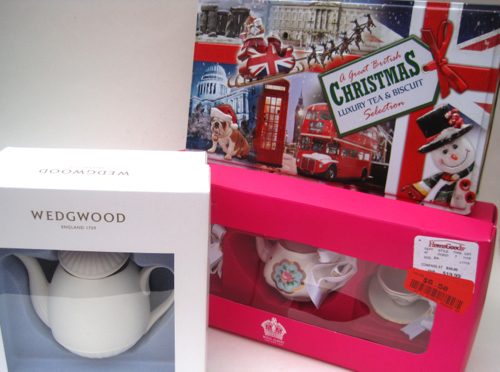 My Aunt Jane and I were in a HomeGoods over the weekend when I came across quite a few bargains on tea treats. 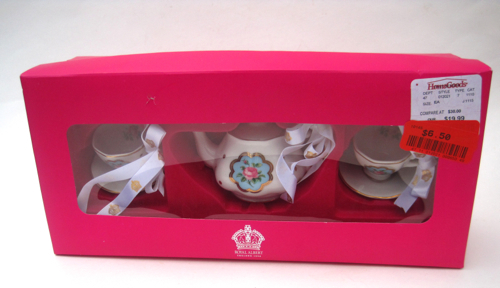 This set of Royal Albert ornaments was just $6.50, which is even cheaper than I paid for ornaments at Cracker Barrel this Christmas! The box is slightly damaged, but the ornaments are just fine. Score! 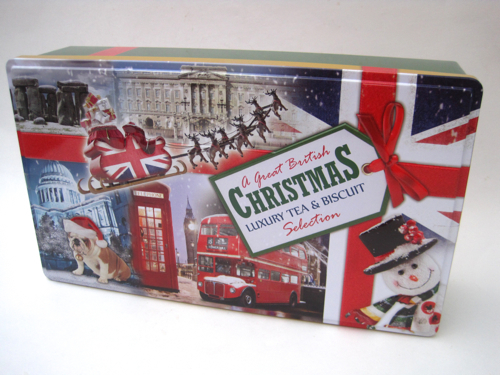 And this pretty British Christmas tea tin caught my eye. It was just $2, and I wanted it regardless of whether anything was inside, but I was pleased to find tea and cookies inside. Since my aunt and I usually have a sweet treat in the afternoon when we're out shopping, we opened one of the two packages of Cranberry Crunch cookies and very much enjoyed them. I haven't tried the tea yet, but since the cute tin was worth more than $2 to me, I'm already happy with this purchase. 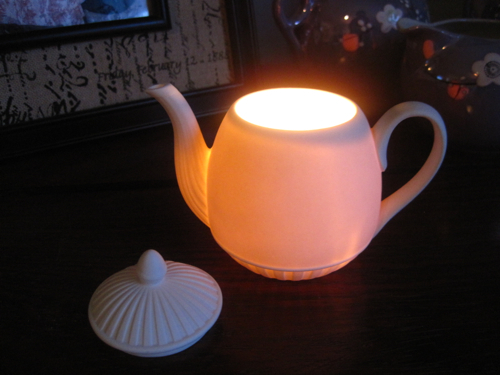 My third treat was this Wedgwood Teapot Votive. This pretty little white teapot measures about 3 inches tall. It said on the box it was originally $40, but I got it for $7. 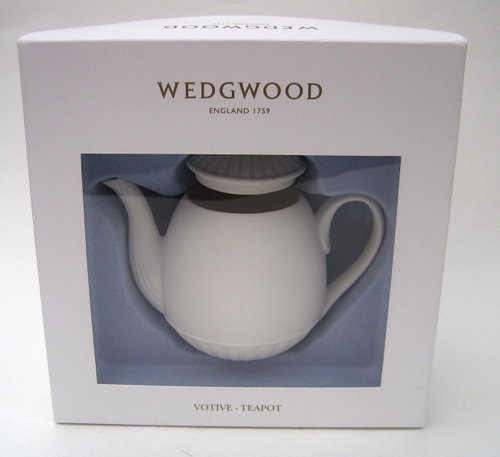 I was skeptical about that $40 price (who would pay that for a tiny teapot, Wedgwood or not? ), so when I got home, I looked it up and found it selling for $69.95 on Amazon. Have mercy! So now I like my $7 Wedgwood teapot even more. It was with the Christmas ornaments at HomeGoods in case any of you want to look for one, but I'm going to treat this as another of my "Winter White" decorations and enjoy the soft candlelight it provides with a votive inside. Anyone else find any tea bargains over the weekend? Which is it: birdfeeder or terrarium? My Country, 'Tis of Tea — An Introduction! 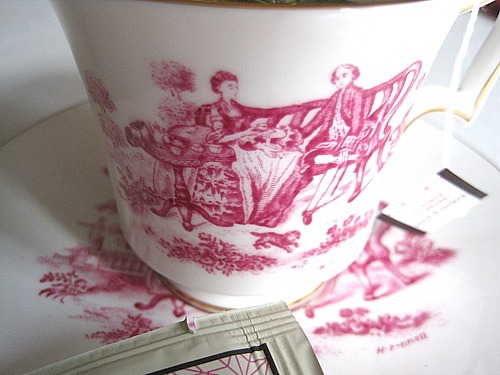 Happy New Year, tea friends!